Fluffy and full, but not TOO full. I like pillows on the softer side-- these are almost too full, but they're not firm. Perfect for watching TV and they stand up nicely and look good on a made bed :) If you're a "centrist" sleeper-- if you prefer soft pillows that aren't too too flat, but can't stand pillows that are so firm they keep your head at a bad angle, you'll be very happy with these. They're very well made, and I love the fact that the cover is removable. Enjoy a cozy night's sleep with this set of down alternative pillows. Crafted with hypoallergenic gel fill, the pillows provide comfortable support that's perfect for side and back sleepers. The soft cotton cover features a charming jacquard-weave scroll design and satin cord edging. All these reviews appear to be from people who've just received their pillows. And all decent pillows feel great at first. The real question is how long they stay that way (particularly for non-down pillows, which tend to harden quite fast). I bought this set of two pillows in August of 2013. I got four months of use out of the first one, then it started getting uncomfortable. It wasn't necessarily hardened to the touch, but I'd wake up with my ear aching (I'm a side sleeper). I started using the second pillow. And that, too, was comfortable for only four months. I could probably get six months out of each pillow if I was willing to wake up with ears aching like a boxer. Note: I fluff my pillows nightly. I've never had a down alternative pillow feel comfortable for longer than four months, and I always buy well-reviewed ones. Again, the problem is that nobody reviews a year later. I'm just going to switch to down and buy a high-quality hypo-allergenic barrier to stave off allergies. As it thins (as down always does), I may place it atop one of these pillows just for the extra height/support for side-sleeping. I'd recommend these pillows... now that I'v purchased 2 more sets totaling 3 (6 pillows in all). The photo show a wrinkly pillow protector but "Candice Olson" hmm I thought she would probably have good products; so I discarded the photo and decided to take a chance...Very glad I did. They are full and yet soft, the fabric is nice quality and so is the stitching. The pillow protector is a great bonus...much nicer than what the local store has. The price is Awesome!!! Unless you are looking for a stiff neck I wouldn't purchase this product. Though the construction seems to be good, the overall feel of the pillows are not good. It is soft for a few inches and then you hit hard and there really isn't much give after the initial few inches of softness. I slept on this the own night and didn't sleep hardly a wink. I bought real down pullows that did not hold their shape as well and as long as these. I have so far purchased thed king and queen sets and will be soon purchasing the standard to add to my collection. They are so soft yet firm if you know what i mean. I wish she sold little 20x20 inserts so i could buy those for my sofa. Amazing!!! I have been on the hut for some great new pillows and I have bought about three other ones that turned out not to be very good, but these are amazing!! Soft like down but they don't get flat after 5 minutes of sleeping and feathers don't stab you in the face! I have had these for about a week now and I am very impressed. I am a side sleeper and my husband is a back sleeper and we both love them. The price is great too. Also they come with removable covers. These pillows are pretty good. I've had a hard time finding pillows that are full enough and firm enough for a side sleeper. I wish these were a bit more full and firm, but their pretty good. I have to admit I've been sleeping well on them. But as a side sleeper, I wish my head would not sink down quite as much in them. It would be better if my neck could be straight instead of tilting down a bit into the pillow, that's what I was hoping for. I haven't found the perfect pillow yet, and it's hard to do in a king size pillow. But these are as good as I've found yet. When I think of down alternative I am expecting something that molds to the way I adjust it. 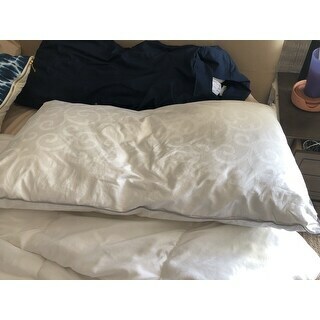 These pillows are nice and of good quality but they are closer to foam then down. I ordered down alternative from O before and returned them, I gave these to my son and he said they are OK. I really wish when a maker uses the words down alternative you could trust it but that's not the case. I think these pillows are of good quality but the description is so misleading that I gave a low score. I have been reading the reviews for both down and alternative on O and have finally decided that you can only buy a pillow for yourself in person. Everyone has their own thing with pillows, it is very much a personal preference, soft to you can be a rock to me and visa versa so I am on my way to **** to find my pillows. After trying countless pillows, I found this to be the one and only pillows for me. As a side sleeper it offers perfect support and comfort. I purchased my first set over 2 years ago, since then, they have lost very little volume. I do wash the zipper covers and fluff my pillows in the dryer every 2 months. I recently bought a second set, and happy to say, they are exactly the same quality as the first set. I have recommended these pillows to friends and family. All of them have been happy with their purchase. Pillows arrived quickly without issues. Compared to all down alternative pillows I used, this set is nice and comfortable. It has nice material and good workmanship. A side sleeper, I would prefer these pillows slightly firmer, but I am quite happy with them, especially for the price I paid. I would be thrilled if these pillows stay in shape for at least six months. I have yet own a pillow (some costed 4x more) that stayed fluffy after a year. I would buy them again to replace the same pillows if needed. I was looking for pillows that are not down due to allergies. When I got these pillows I was completely shocked at how much these are like down, but without the allergy problems! They are firm, but still with the same down comfort. These pillows are huge - about as big around as a basketball - and they are hard. They don't conform to your head and shoulders, at all. They would make great sofa cushions - they're that dense. The problem with such hard and big around pillows is that when on your back, they force your chin down toward your chest. If on your side, your head is cranked toward your shoulder. In other words, your head and neck are forced to conform to the big, hard pillow instead the pillow conforming to you. Marketed as "down alternative" (down being soft and conforming), these pillows don't fit that description AT ALL. I'm really bummed that I bought them because Overstock does not have a good return policy. I've slept on them so I'm out of luck. In my opinion, if a product is misrepresented then it should be refunded. 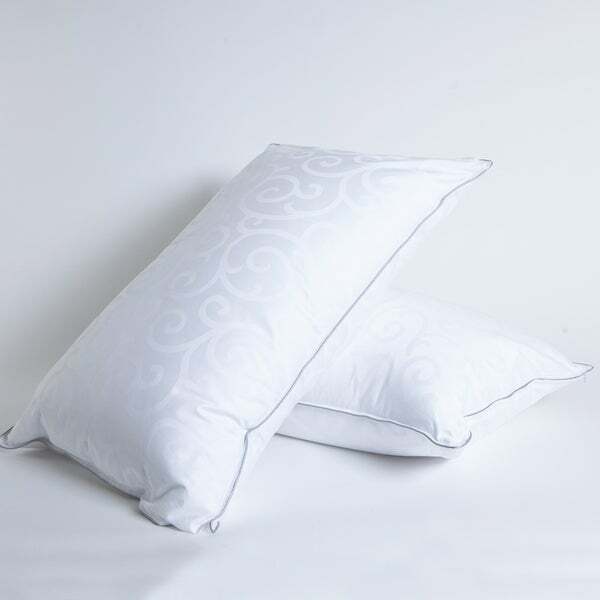 If you want a soft and conforming pillow, you will hate these. If you want something so big and firm that you could use them as backrests, you'll like them. My two cents. Maintain their shape and fullness. I've had them more than a year. I am allergic to down so down fill was not an option. F I N A L L Y!!!! My husband and I had spent too much money on "bargain" pillows and I was at my whits end. We were not sleeping well, waking up with pain, enough was enough. These pillows are a great price but also they are full and soft. They melt around my head but bounce back to shape when my head isn't on them. love the look and feel, the added cover is a nice little bonus. I love them and hope they last a while. Will definitely be ordering more! I ordered these because my friend who is allergic to down was visiting. She indicated the pillows are comfortable. Would recommend. These pillows were a wonderful edition to my bedroom. They were comfortable and plush and added an elegance to my bedroom. The look and feel of these pillows would make you believe they cost a lot more than they did. These were a great find. Love these pillows. They are nice and firm and need to reorder more. I am a stomach sleeper and these pillows work for me. They are good quality and made very well. The price is good for the quality of the pillows. I had high hopes for these pillows. We have been looking for pillows that will hold up for at least a year. I have had these for just over a month and they are already breaking down. I am disappointed. Great pillow for the price. Very comfortable and durable. We use these in the master bedroom and they look great as well as being very functional. "Do you anticipate this product being available in the future in king size?" Hello wtjones, items are restocked as they become available; however, we cannot guarantee an item will be restocked. You will be contacted by us if the pillow gets back in stock. Thank you for shopping with us. I purchased these pillows about a month ago and absolutely love them. "what is the gel made from?" Hello Marlene, The Down alternative gel fiber, is made of polyester. Thanks for shopping with us. "Where are these pillows manufactured?" Thank you for contacting us narab. These are made in China. Please let us know if you have any further questions. "Does this pillow have a gusset? The other Candice Olsen pillow says it has a 2" gusset in the q&a. This one does not appear to have it. Thanks." Hello mcs121, this particular item does not have a gusset. If you have any additional questions please feel free to let us know. Thank you for shopping with us!